Four days to go and it's Christmas day again. The best time for us to prepare, cook and serve best traditional recipes in our dining table. 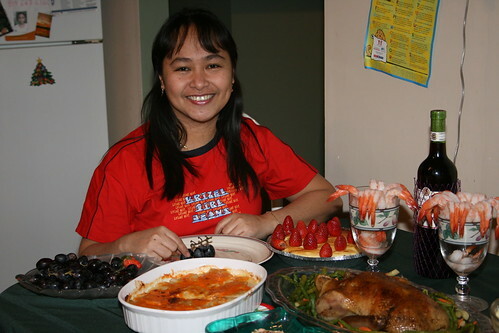 Every Christmas our favorite dishes are roast turkey, cheese cake, shrimps, chicken, potatoes, of course rice, fruits and vegetables. This Christmas we plan to cook the same recipes. We will prepare Roast Turkey, the favorite recipe of most Canadians and Americans especially during Christmas. It's one of the traditional food here that's why my sister love to prepare and serve it at dinner time. I become fat this Christmas so I need to buy diet pills. It's the most effective weight loss pills available online. It's safe, natural and affordable. No need for you to travel anywhere you can easily purchase online. You can eat plenty of yummy foods during Christmas day until new year. Well, if you need diet pills just check out weightlosspills dot net and order now. Oh yummy, yummy! We'll be having turkey on Christmas day as well. wow. i love all of them! we will have turkey on Christmas too... but mom-in-law is roasting it.